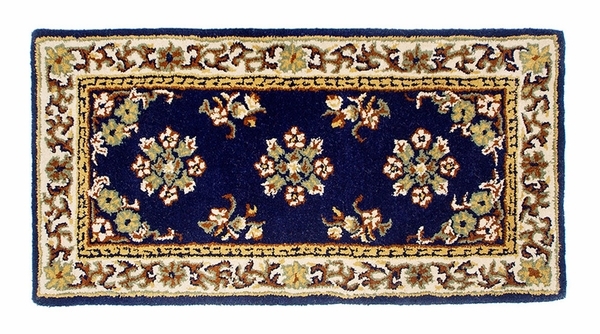 Elegance is the name of the game with this gorgeous oriental hearth rug. The muted neutral colors in the central floral insignia and in the various bordering designs complement the hearty navy background perfectly. But there is no sacrifice of function for style, either, with this piece. Minuteman's 100% virgin wool material is saturated with dye for excellent quality. Even near a roaring fireplace, this rug is safe-it meets federal flammability requirements for small carpets. This piece will protect your floor, accent your room's design, and offer you (or your pet!) extra warmth on a cool night. Feature this rectangle anywhere indoors!